A company’s master schedule focuses on creating the product or delivering the service that a company is in business to sell. Good operations management is essential. This commodity often requires materials and processes, and the collection of parts and activity can become complicated very quickly. Material requirements planning (MRP) is a computerized information system designed to help manage the ordering and scheduling of the components, parts, and raw material that make up a company’s end product. Demand for these components is often referred to as dependent demand because the quantity demanded depends on the consumer demand for the end product. Master production schedule: The master schedule shows the quantity and timing for a specific product to be delivered to customers over a specific period of time. 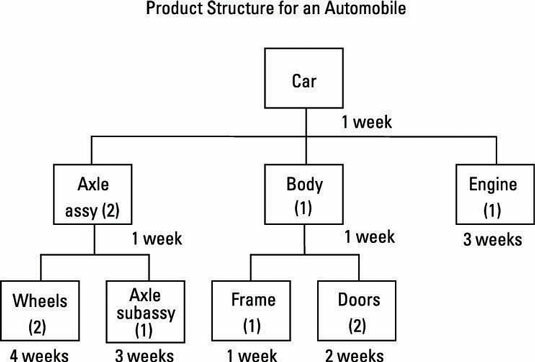 Product structure: This diagram shows all inputs needed to produce the product. It may also show assembly order. Bill of materials (BOM): This input is a listing of all the items needed to produce an end product. It’s much like the list of ingredients in a recipe. For MRP, you must also know the expected lead time, the time between the ordering of parts and their delivery. 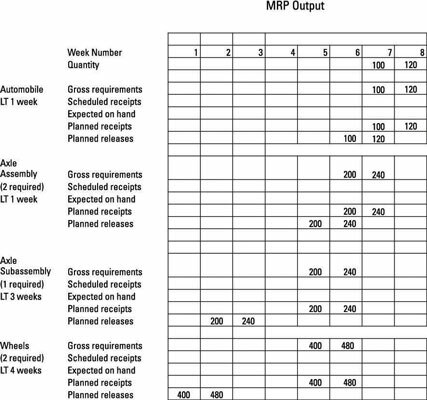 The MRP system takes the master production schedule, product structure, BOM, inventory record, and lead time information and creates a material requirement plan for each item. The process starts with the number of end products desired in any given period. The software uses the product structure and the BOM to determine how many of each assembly and subassembly are needed — and when — to make the end product. Using current inventory levels, the system provides the manufacturing staff with a work release, which points out how many items they need to actually produce. This process repeats down to the raw material level. If you need 100 automobiles in week 7 and 120 in week 8, then the MRP system breaks out the master schedule into separate plans for the automobile, the axle assemblies, the subassemblies, and the wheels. The company needs 100 automobiles in week 7. Because the company has a one-week lead time, it needs to release the required materials into the plant during week 6, which means that 200 axle assemblies must be ready at this time. Given the one-week lead time to produce an axle assembly, the company must release the material needed to produce the assemblies at week 5. Notice that producing a subassembly takes 3 weeks, so the company must release materials for 200 axle subassemblies at week 2. For the same reasons, it needs to release materials for 400 wheels at week 1. These calculations are repeated for the 120 automobiles needed at week 8, although, because of the 20 percent increase in demand, all the quantities grow by 20 percent. MRP reporting makes it quick and easy for an operations manager to see the required timing for future operations. For example, if you’re managing the axle subassembly operations, you know that at week 2 you need to begin production for the 200 subassemblies required for a week-5 delivery to the axle assembly area. MRP releases raw material onto the factory floor as needed but doesn’t schedule the individual resources (machines and people) needed to produce the product. Scheduling jobs can be problematic when specific resources are required for multiple products or jobs. Which jobs do you schedule first? First-come, first-served (FCFS): Process jobs in the order that they arrive. Also known as first-in, first-out (FIFO). Shortest operating time (SOT): Start with the job that has the shortest processing time. Earliest due date first (EDD): Begin with the job that has the earliest required date. Critical ratio method (CR): Calculate the time remaining until the due date and divide it by the total processing time remaining. Start with the job with the smallest ratio. The metrics you use to evaluate the advantages of each scheduling method include the flow time and the job lateness. Flow time is the length of time a job spends in the facility. It includes not only processing time but also the time the job waits to be processed. Calculate job lateness as the difference between the actual completion date and the due date. Unfortunately, no one method is better than the others in all circumstances. Evaluate all the methods for each series of jobs to find the best approach for a given situation.